Due to the poor weather conditions, the board meeting scheduled for Monday, February 11, 2019 has been CANCELED. All board meetings are open to the public. The next board meeting is scheduled for Monday, March 11, 2019. Please make an effort to read and report these counts whenever you can. When you send a report, please enter your initials in the Comments field. Be sure to report problems with the counters including readability of the display. We are attempting to improve the visibility of the display. 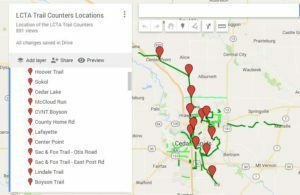 Perhaps the easiest way to report the counts is to put the link linncountytrails.org/trailcount on your cell phone home page. You can also load a QR app on your phone to read the QR code on the counter post. This will automatically load the counter location. If instead you click the trailcount link you will have to select the location from a drop down list. The location number and name are displayed on the counter post. In either case, do not bother with entering date and time because your phone will automatically insert the current date and time. Date and time entries are needed if you write the counts down on paper and report them later from home. The Linn County Solid Waste Agency has rescheduled the grand opening of the Mount Trashmore trails to Thursday September 13th at Noon. They warn that event parking would could be limited, so it might be best to ride the trail from Sokol Park, or from another trail head to the event at 2250 A Street SW. The entrance is located next to the Cedar River trail, just past Sokol Park. Their website has great information about this event, and has a map of the three trails that will be opened for use. The access to these trails will vary daily depending on weather, trail conditions and landfill maintenance. Due to the risk of severe weather, the Mayors’ Bike Ride committee has chosen to cancel the annual Linn County Trails Association’s labor day Mayors’ Bike Ride. Thank you for understanding. We’ll see you next year! The weather is warming and it is time to get out on the trails for another season! Linn County Trails Association works to promote trails, trail maintenance and construction of new trails. An important means of doing this is by measuring trail usage to demonstrate demand for more and better trails. We need you to read and report the trail counts. Trail counters are at 12 locations within the Metro trail system as listed below. The counters may be recognized by two brown or blue posts located across from each other. The tallest post has a window on the top with a 6 digit display of the accumulated count. Simply record and report the number. The easiest way to report a trail count is with a smart phone while at the trail counter location. Type into your browser linncountytrails.org/trailcount and fill in the form. The counter location is shown on the post and date and time are automatically recorded when reporting at the counter. If you store the trailcount URL link on your home page, you can save the effort of retyping it every time. Alternatively, you can also install a free QR code reader on your phone and read the QR code on the post to automatically bring up the form and chose the counter location. These instructions are also on the counter post. While you are reporting, please run a test to verify that the counter is working, by slowly waving your hand across the beam between the two post and verify that the count increments. There is a check box on the reporting form for “counter is not working”. We do struggle to keep fresh batteries in the counters. Last year saw completion of Cedar Valley Nature Trail paving through Center Point which was supported by a $103,000 donation from LCTA. 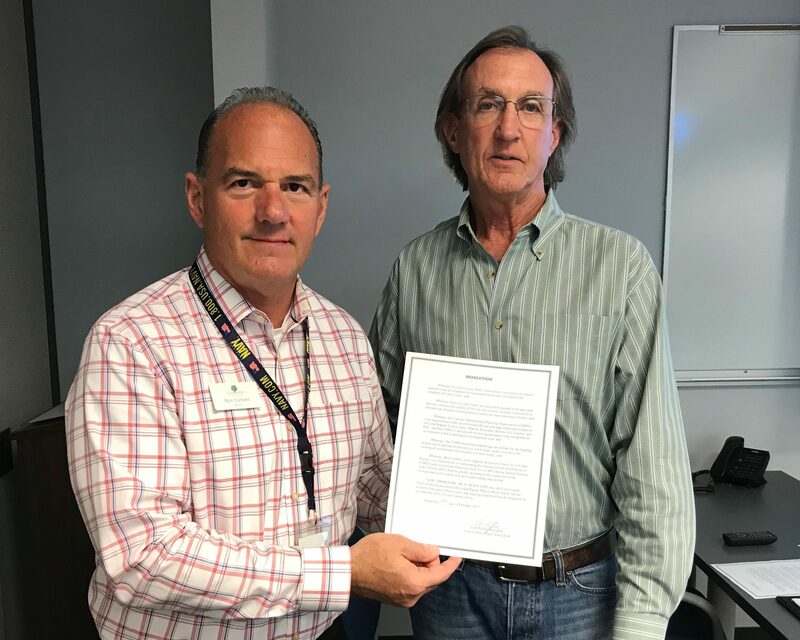 This year we are working to a) support funding for an extension of the Lindale Trail to connect the Cedar River Trail and b) support engineering planning for the Hwy 100 Trail near Xavier High School going towards the Cedar River and eventually across the river at the old railroad bridge pilings downstream from the Hwy 100 bridge. Through demonstrated trail usage and financial contributions from LCTA supporters, we can speed up the development of these trails. Anderson Bogert is hosting a public open house to share details of the planned improvements design requested by Linn County Conservation to the Grant Wood Trail from Highway 13 east to Oxley Road. The open house will have no formal presentation. The meeting will be held on March 6th from 4:30 to 6:00pm at the Red Cedar Lodge, 1700 Big Bluestem Dr. in Marion (Located in Squaw Creek Park). The project consists of improvements to the trail surface and adjacent drainage ditches throughout this 3 ¼ mile trail segment. The segment from Hwy 13 to Waldo’s Rock Park will be paved with concrete and will provide a connection to the park. The remaining segment easterly to Oxley Road will be have a limestone granular surface and a wider turf shoulder along the north side. The elevation of the trail will be adjusted to allow for side ditches to promote adequate drainage flow. Construction is scheduled for the latter half of 2018. After construction,some of the open areas will be reseeded with a prairie mix and trees will be planted. With the fresh snow that we’ve had, it would be good to remind everyone about the trails that are groomed in Linn County for cross-country skiing for when the next powder falls. The trails groomed for skiing include the Sac & Fox, Morgan Creek park, Wickiup park, Matsell Bridge park, Pinicon Ridge, and Squaw Creek. There are also groomed cross-country trails at the Twin Pines, Ellis, and Jones golf courses too. As a courtesy to the cross-country skiers out there, please avoid walking in or riding bikes in the tracks used by skiers, this can really make a big difference for them. After several months of construction and final touches, the Cedar Valley Nature Trail paving project from Schultz Road to Ash Lane in Center Point is complete. Linn County Trails Association and Linn County Conservation will join to hold a public ribbon-cutting ceremony and celebratory trail excursion, beginning at 1 p.m. on Saturday, August 12, 2017 at the Center Point Depot Museum, 700 E. Washington St, Center Point, IA. Rain or shine, guests are encouraged to bike to the event. The Cedar Valley Nature Trail opened to the public in 1983. 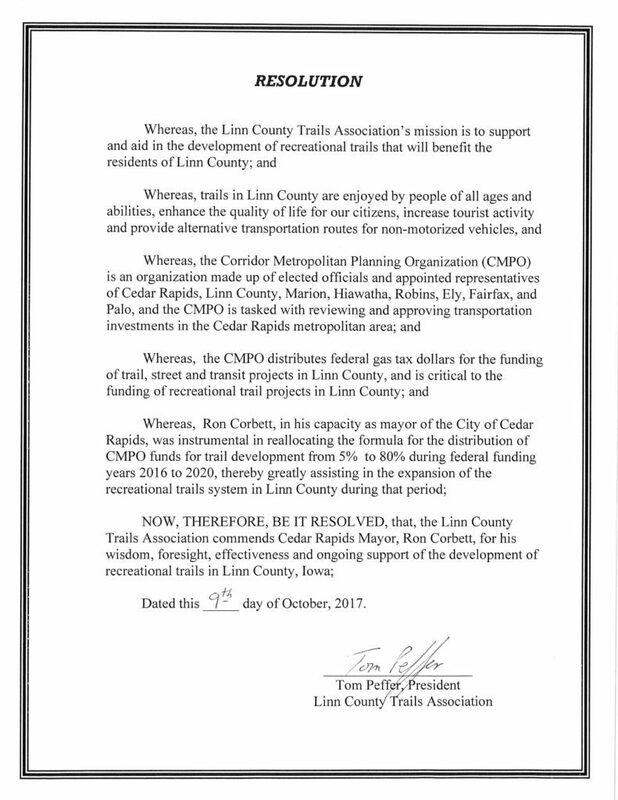 Linn County Trails Association’s 2015 Capital Campaign raised more than $100,000 toward the asphalt and concrete surfacing project. A plaque at the train depot in Center Point displays the names of donors and organizations that contributed to the project. The total project cost was $1.36 million, including major funding from Linn County Conservation and $600,000 from the Iowa Department of Transportation’s State Recreational Trails Grant. Both groups’ efforts continue to help close the 22-mile gap in hard surface along the trail, from Center Point to La Porte City. Linn County Conservation is already working to pave the trail to the Linn County line, having just replaced a bridge over West Blue Creek. A bridge replacement over East Blue Creek is tentatively scheduled for next year, which will allow for hard surfacing to continue to Urbana. The Cedar Valley Nature Trail connects nearly 70 miles from Cedar Falls to Ely on a mix of soft and hard surfaces. It is one of the nation’s oldest rail-trails, and an important segment on the American Discovery Trail, which will eventually connect the Pacific Ocean in San Francisco to the Atlantic Ocean in Delaware. Linn County Conservation has let us know that the Cedar Valley Nature Trail from Boyson Road North to Robbins is closed today (6/5) and possibly tomorrow for seal coating the asphalt surface. The CVNT from Shultz Road to Iowa Street is scheduled to be seal coated on Wednesday, so it will be closed during that application. Please let the crews complete their work and do not cross any barricades you encounter on the trail.